Understanding the importance of collection and compilation of data relating to industrial sector of the country, the Government of India, after 1930, launched a voluntary scheme for collection of detailed data from important industries in India. During the Second World War, in order to cater to the specific requirement of war management, each government department created its own statistical sections. In 1942, Industrial Statistics Act was formed on the recommendation of the Royal Commission on Labour. A Directorate of Industrial Statistics (DIS) was formed in 1945 under Ministry of Commerce to administer the act. DIS started Census of Manufacturing Industries in 1946. 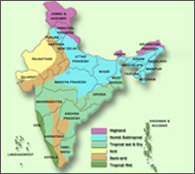 After independence, Central Statistical Organization (CSO) was set up under Cabinet Secretariat by the Government of India in 1951 as an apex statistical body for co-ordinating the large variety of data collected by various agencies which was necessitated for adoption of planned economy by the government. In 1956, the Industrial Statistics Act 1942 was repealed with the passing of a more comprehensive Collection of Statistics Act 1953. Subsequently DIS was transferred to the Cabinet Secretariat in 1959 and was attached to Central Statistical Organization as Industrial Statistics Wing (IS Wing). Now Central Statistical Organization becomes Central Statistics Office.